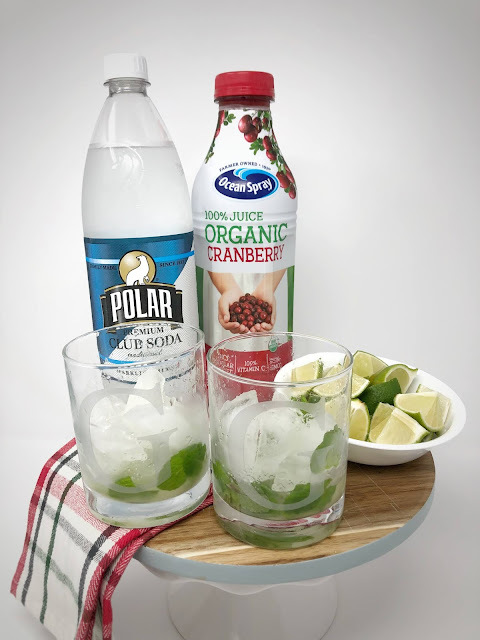 With all of the upcoming holidays on the horizon, I wanted to share a mocktail recipe that is perfect for entertaining guests, and everyone can drink it - even the kids! My love for mocktails started a few years ago when my husband and I went on our honeymoon cruise to the Caribbean. My husband and I don't drink alcohol, but the beverage package that we purchased on the ship included whatever soda and mocktails we wanted. We loved getting to try all of the different drink creations that they can make! Our favorite drink hands down was a virgin mojito. 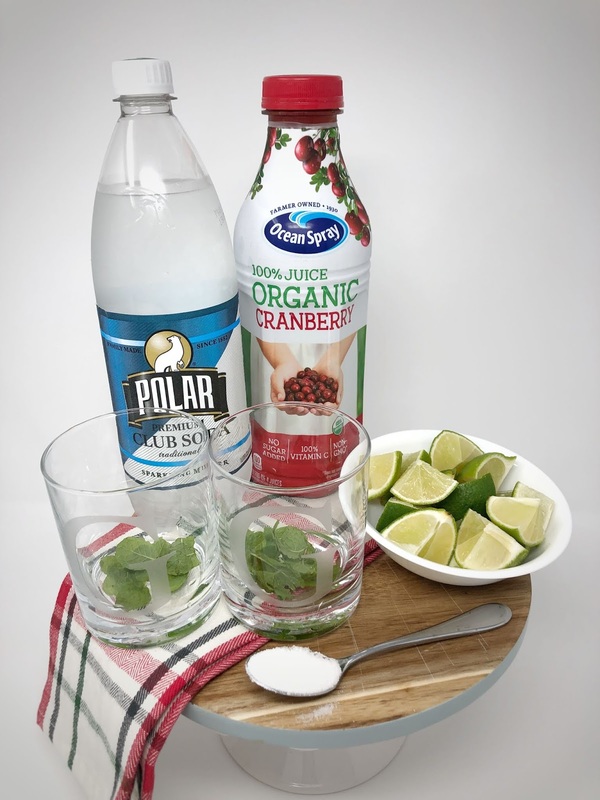 Mocktails are so easy to make, but they add a bit of sophistication to your party, and you can customize them fairly easily! I created this virgin cranberry mojito by combining some of the basic components and flavors of a mojito with a little holiday twist! I'm going to walk you through how I made these, but for the record, I didn't measure any of the ingredients exactly. 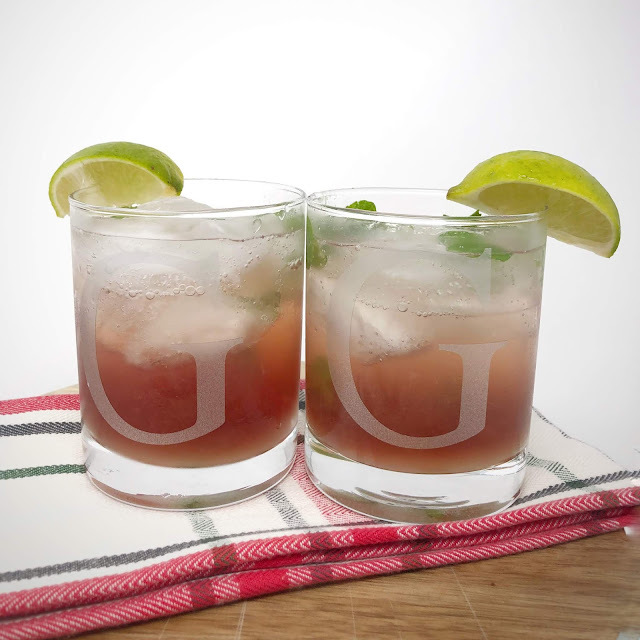 I started by adding a few fresh mint leaves to the bottom of these adorable monogrammed highball glasses by SpringerMade. I added ice and a spoonful of sugar (add more or less depending on how sweet you like it). You will also squeeze one whole lime into each glass. Fill the cup about halfway with cranberry juice. This would be a great point to customize this however you'd like! I've made it with grapefruit juice, and we love it that way too! Top it off with a bit of seltzer water and give it a stir. Voila! You have a super fancy holiday drink that tastes amazing and is made with just five simple ingredients. If you give this recipe a try, let me know what you think! You can pick up your own monogrammed glasses from SpringerMade at 15% off by using the code EMILYG at checkout! What a great recipe that everyone in the family can enjoy! Great idea! Thank you so much! It really is delicious - I hope you try it out! Since we don't drink at all this is perfect. Always great to find some drinks we can enjoy during the holidays. Yes, I'm with you! Just because you don't drink doesn't mean you shouldn't try some fun, fancy non-alcoholic beverages! Yes!! You will have to let me know if you enjoy! Yum this sounds so good! I usually don't enjoy alcohol unless it's super fruity haha, so this is right up my alley! Yay! You will have to let me know if you give it a try! 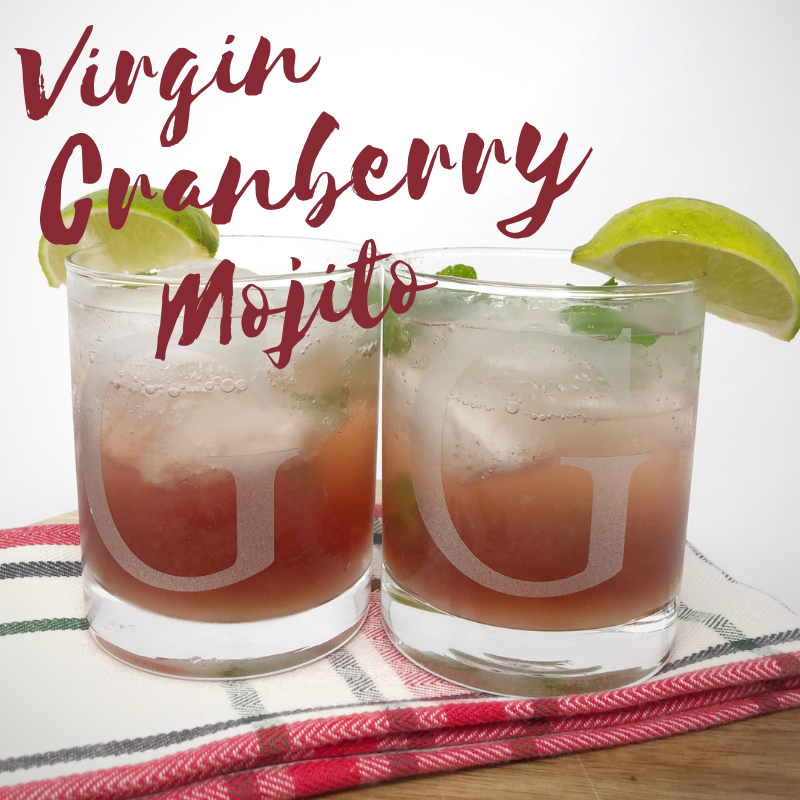 This sounds so refreshing for the holidays and I adore those monograms! Thank you so much! 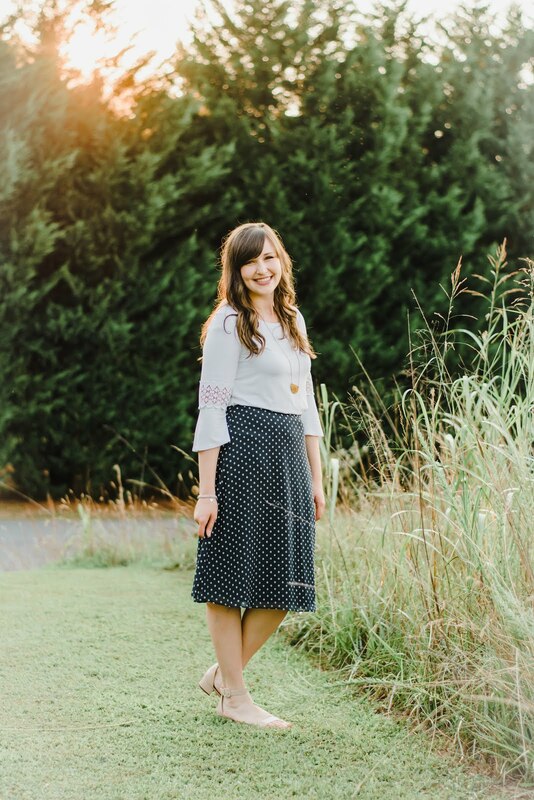 SpringerMade is the best! Yay!! I'm so happy this encouraged you to try out something knew! 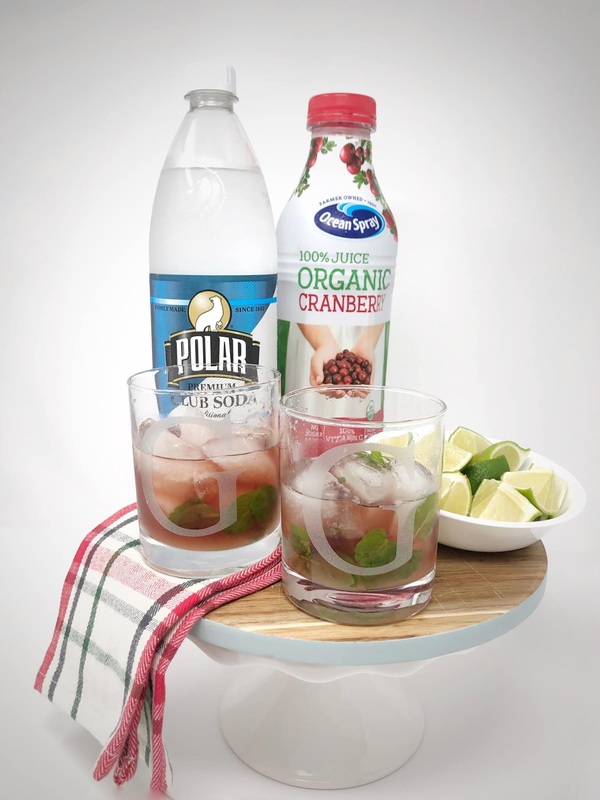 I also love cranberry juice with lime and sparkling water, but the mint gives it such a fun taste! These sound amazing!! My husband doesn't drink and I think he would absolutely love these. Yum! This looks delicious! I cant wait to try it! Perfect the DD or expecting mama!